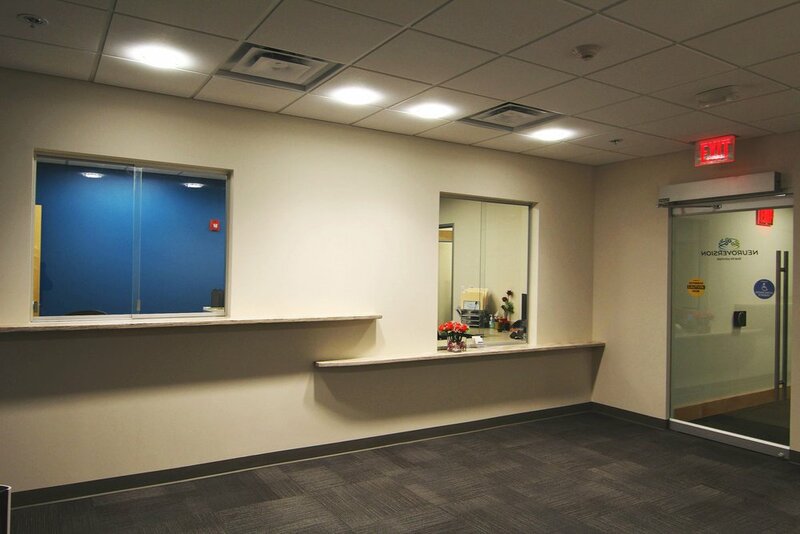 This was a 5,000 square foot tenant improvement in Anchorage, Alaska. This project began November 2018 and was completed February, 2019. This tenant improvement included new counter tops and casework, doors & hardware, glass wall systems, flooring, painting, and electrical and mechanical upgrades. Major team mates on this project included: Bettisworth North Architects, Northern Electrical Engineering, Last Frontier Mechanical, Encore Electric, Acme Painting, Capital Office, Commercial Contractors, and McKinley Fire Protection. This was a 7,000 sq. ft. tenant improvement in the Peterson Tower located in downtown Anchorage. Work included: updated storefront glass doors, acoustical ceiling tiles, flooring, painting, and glass wall systems. Our in-house cabinet shop created a custom kitchen to fit their specific needs. We began this project in June 2018, we completed the work in September 2018. This was a 33,500 sf tenant improvement. The main area included adding a vestibule, register, cash wrap, changing rooms, training rooms, job connection area, and bathrooms. The back area included adding a janitors room, break room, server room, managers office, as well as the loading and processing areas. Our major team mates in this project included Lumen Design, LLC, Acme Painting, Alaska Specialized Constructors, Commercial Contractors, Encore Electric, Miles Plumbing and Heating, Northmen Glass, and Samson Electric. A 7,825 sq. ft. complete build out of a shell for the AA Spine and Pain Clinic’s new location located at Alaska Regional Hospital. Facility includes day surgery rooms, exam rooms, doctor’s offices, and lead lined exam rooms for special procedures. As part of the project we provided all new custom casework and sliding glass. We were asked to participate in a competitive bid in June of 2016. Criterion General was successfully awarded in June 2016 and work began in June 2016. The project was brought to a close September 1, 2016. This is a 600 sq. ft. fitness studio located in the Kuukpik Office Building. We were asked to construction Kuukpik fitness during the construction of the Kuukpik Building. Design build team members involved in the building construction quickly coordinated to design and complete this project during the final phase of construction. The team consisted of Pfeffer Development, kpb Architects, EBSC Engineering, Reid Middleton, Inc., Accel Fire Protection, design build mechanical and electrical with General Mechanical, Inc., and Alcan Electric, Inc. teaming with RSA Engineering, Inc. The project included an shower room, locker room with keypad lockers, and fitness area large enough for cardio equipment, free weights and a cabled weight machine.